Turned brass handrail knobs, bored for .045 handrail wire. Pack of 12. Turned brass medium length handrail knobs. 2mm boiler to .045 hole. Pack of 12. Turned Brass WD Short Handrail Knobs. Also suitable for wire suspension systems. Pack of 12. Turned Brass Long WD Handrail Knobs. Cross-drilled for .045 wire. Pack of 12. Machined Brass Tee Carriage Door Handles with collar to aid fixing. Pack of 16. Turned brass conduit holders for roof mounted power lines etc. on EMUs. Cross drilled for .5mm wire. Pack of 12. Assembled Screw Link Couplings by Romford. Etched hooks, wire links. One pair. Pre-assembled 4mm scale three link couplings by Romford. Etched hook, wire links. One pair. Square turned brass frame spacers with fixing screws. 11mm wide. Pack of 3. 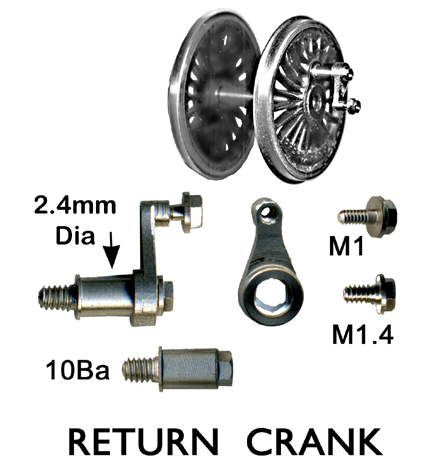 Deluxe crankpin set for Romford driving wheels with screw on retaining nuts. Assemble using Romford screwdriver 4MA013. 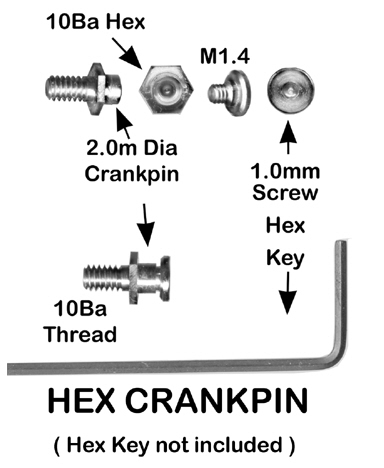 Set of six crankpins. Hollow ended, machined nickel silver small valve gear rivets .083" long. Pack of 20. Hollow ended, machined nickel silver valve gear rivets, medium length, .110". Pack of 20. Detailed, Westinghouse air brake pump with finned lower cylinder.Manufactured from pre-assembled turned brass components. As fitted to WD 2-8-0 and 2-10-0 in military service and to certain BR 9F class 2-10-0s. Turned brass parts to make one BR smokebox door handle (Smokebox dart). Machined brass parts to make one smokebox door handle (Smokebox dart) for Southern, LNER or GWR locos and many others. Turned brass parts to make one smokebox door handle with central handwheel (Smokebox dart). Suitable for Great Central, LNWR and many other locos. Machined brass reversing lever with quadrant. Suitable for GWR, Southern and many other locos. Machined brass GWR style screw reverser with handle. One. Machined brass SR/LMS style screw reverser with wheel. One. Machined brass LMS/BR style screw reverser with handle. One. Turned brass gearbox bushes for 1/8" shaft. 3.65mm outside diameter x 0.46mm deep. Pack of 12. Turned brass 2mm axle bushes. 3mm outside diameter x 3mm deep. Pack of 12. Turned brass bearings for pinpoint rolling stock axles. 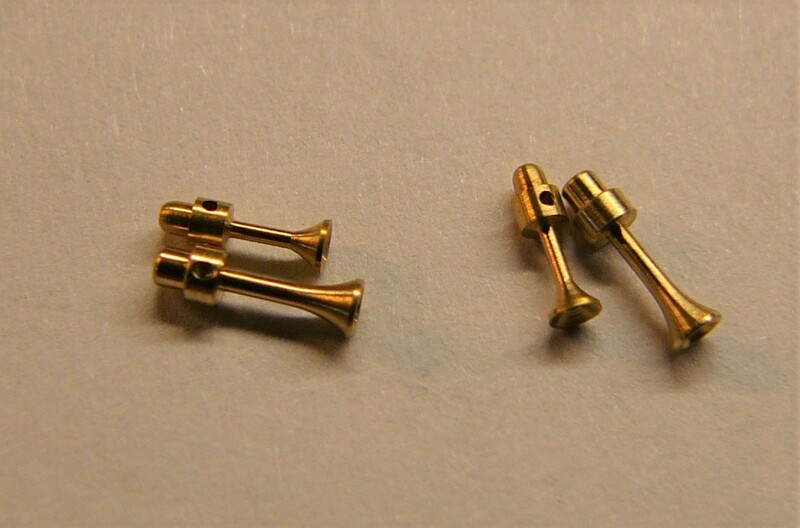 Full size 2mm diameter body with flange. Pack of 50. Turned brass bearings for pinpoint axles. No flange. Pack of 50. Universal joint set for 1.5mm drive shafts. Machined in brass and steel. Drive shaft can be cut to length and the ball joints fixed with Loctite. The coupling cups are machined in brass and grub screw the motor and final drive shafts. Universal joint set for 2mm drive shafts. Machined in brass and steel. Drive shaft can be cut to length and the ball joints fixed with Loctite. 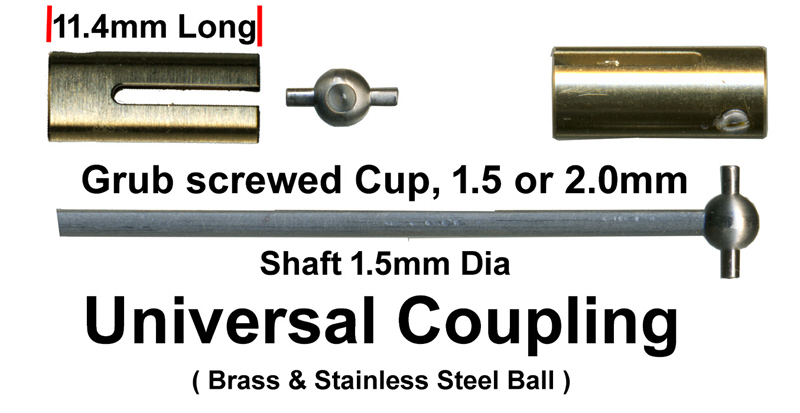 The coupling cups are machined in brass and grub screw the motor and final drive shafts. Turned brass whistles for GWR. 1 pair. Turned brass whistle for LSWR/SR locos including M7. Turned brass airhorns, short and long. Two pairs. Web Design by Perfect Page gu.